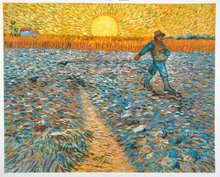 With the rising sun just above the horizon and a lone farmer working tirelessly to plant his crop, this work of Van Gogh depicts his respect and passion for nature. Van Gogh is one of Holland’s most distinguished artists. Our expert painters have studied in depth all of his painting techniques and skills, such as colour mixing, rhythm of application, impasto, ambience to light, and many others. 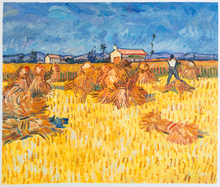 During his stay at Arles in Southern France, Van Gogh created some of his best works. Over a period of 444 days, he created over 100 drawings and over 200 paintings. Many of these were focused on the fields that farmers sowed their wheat. Even though he worked constantly on these paintings, he still found time to write hundreds of letters to his younger brother, Theo. It seemed he was most happiest at this time of his life — the letters passionately spoke of how he was pleased with his work, and maintained confidence and clarity of thought. 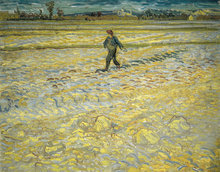 Van Gogh expressed his love for working with natural subjects and scenery. To him, nature was a part of the divine, and something that should be treated with utmost care to capture into art. In this painting, you can see the rising sun in a deep citron-yellow colour that seeps into the morning sky. In the foreground, a lonely farmer plants his crop, unaware of the passage of time behind him. One of Van Gogh’s primary reasons for coming to Arles was his intention to study advanced techniques on painting, especially Japanese styles, which he found extremely interesting. In addition to learning Japanese styles, he also focused on impressionism, where he found that he could effectively create landscapes that were rich in colour.